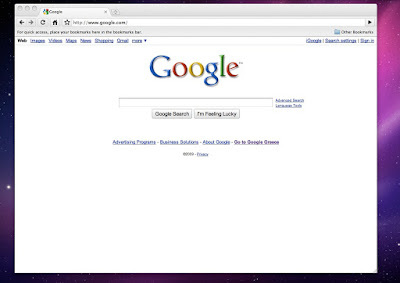 Chrome is finally available to both Linux and Mac users. I have really enjoyed using Chrome in Windows but since i don't use Windows that often I would have really liked it to be available for the Linux and the mac platform. Google heard my geek prayers and released Chrome 4 beta. I installed it and run to both platforms without any problems and to my delight there were ready-made packages for Ubuntu, as well as for Fedora and Suse all having 32 bit and 64 bit versions. One noticeable difference of the two versions is that the Linux one keeps the default blueish theme while the Mac version has a metallic theme obviously to play along with the rest of the metallic theme of OSX. In addition one, hiccup is that In Ubuntu, Chrome does not follow the windows behavior set in user preferences. Thus, for example, if you have set for a window to roll-up if you double click on the titlebar it will just stay there which is kinda disappointing. I guess its still in beta and better integration will come in the near future as soon. In addition, the mac version does not support extensions for now which is a bummer since extension have some very useful stuff. in Linux version though they are enabled and ready for use. I like Firefox but it has started to get to my nerves how painfully bloat it has become. When Firefox came out 5 years ago it was bleeding fast compared to Internet Explorer, which was one of the reasons it became the browser of choice for many people. Chrome still lacks the plugin support that Firefox enjoyes but it will come in the near future (the extensions are in beta as well). All I can say Chrome is the new Firefox.